Nihon-ji is a Buddhist temple that was built in 725 by the Buddhist priest, Gyoki, on the imperial order of Emperor Shomu. The temple was built as a Hosso-sect temple but was later transferred to the Tendai and Shingon sects. During the reign of shogun, Tokugawa Iemitsu, the temple was transffered to the Soto sect and still remains a Soto temple to this day. The temple is located on the slopes of Nokogiriyama(Mount Nokogiri) in Chiba Prefecture. Travel Tip: It takes about 2 hours minimum and lots of walking to see all the sights inside the temple. The Daibutstu(Giant Buddha) of Nihon-ji is a 31.05-meter tall stone statue of the Yakushi Nyorai(Buddha of healing and medicine). The original Daibutsu was built in 1783 after 3 years of construction by over 200 workers. 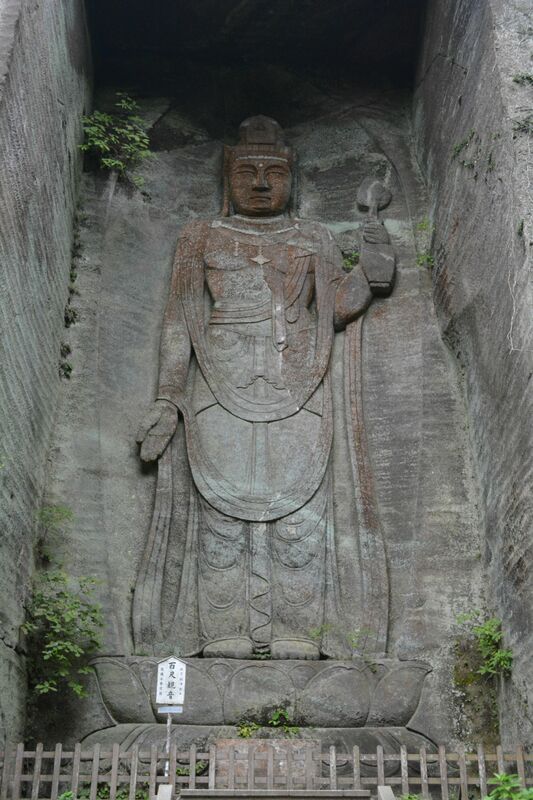 By the late Edo Period, the Daibutsu had suffered from severe erosion and was finally restored in 1969. Some of the Rakan(arhat) statues enshrined. During the period of around 1779 to 1798, a Buddhist monk and 27 of his disciples carved 1553 Buddhist images out of stone and enshrined them in various spots on Nokogiriyama, the mountain where Nihon-ji is located. 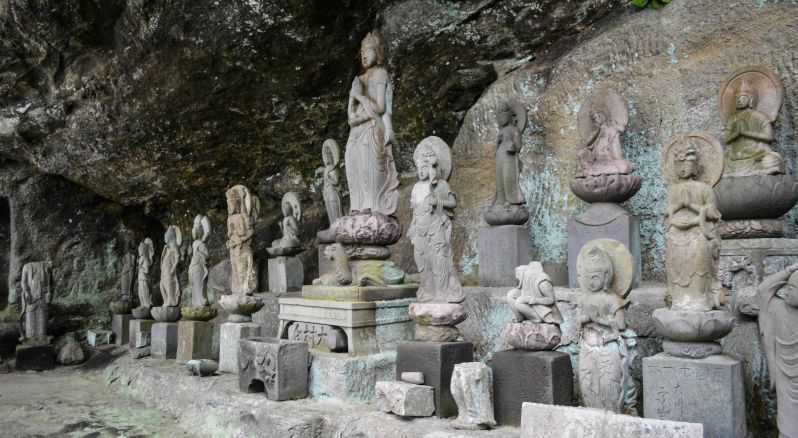 Many of the statues have been beheaded or destroyed during the Haibutsu Kishaku anti-Buddhist movement after the Meiji Restoration. 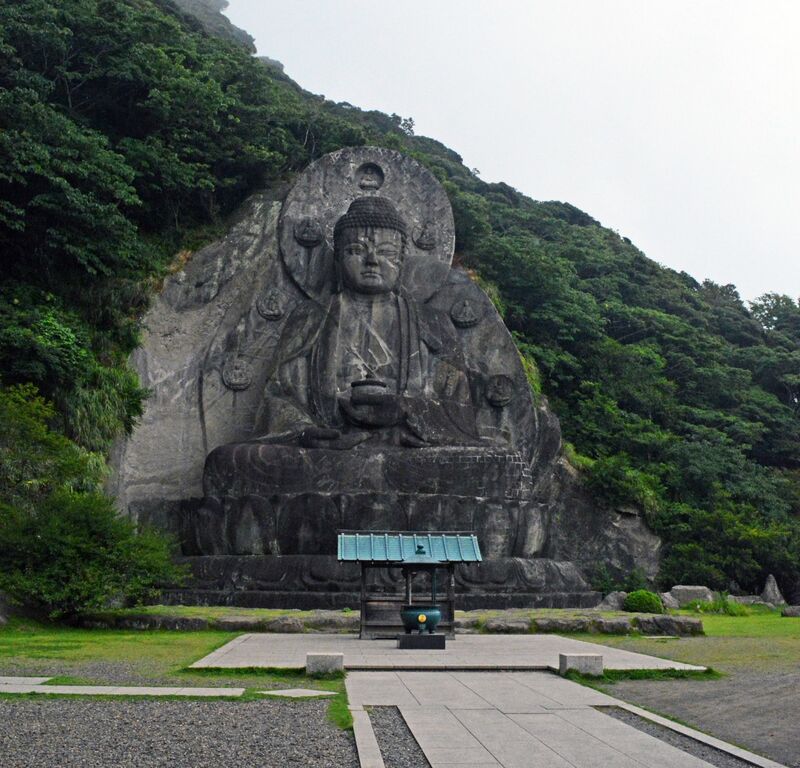 The Hyakushaku Kannon statue is a 30.3-meter-tall stone statue of the Kannon Bodhisattva that was built on 1966 after 6 years of construction. It is meant to repose all the victims of the World Wars and the dead resulting from traffic accidents in the Tokyo bay area. In 1989, a part of the Bodhi tree in Bodh Gaya was given to Nihon-ji by the Indian government as a gesture of world peace and the amity between India and Japan. The tree is planted near the Daibutsu. The easiest way to get here is by car but for those who do not have a car, you can access the place by ropeway or by hiking up the mountain. A one-way ticket for the ropeway costs 500 yen for an adult(over 12 years old) and 250 yen for a child(6 to 11 years old). Note that the ropeway may stop operating during inclement or gusty weather. To get to the base of the mountain, where the ropeway station is, you must walk from Hamakanaya Station(8 minutes) or from Kanaya ferry port(12 minutes) where the Tokyo-wan Ferry operates ferries to Kurihama port, near Yokosuka, in Kanagawa Prefecture. The entry fee into the grounds of Nihon-ji is 600 yen for an adult and 400 yen for a child aged 4 to 12 years. The temple is open from 8:30 to 17:00.